On the award ceremony "shining 52th! Japan Record Awards", held on the 30th, the winner of the Best New Artist award was 4-member idol group S/mileage. On April last year, they were chosen from Hello! Project Eggs. They had their major debut on May this year with the single "Yumemiru Fifteen". The average age of the group is 15 years old. At the moment they received the award, they said the phrase "We're the idol group of the short skirts in Japan". The four of them said "kyaa!" with joy, and, while crying, they also said "We'll do our best in order to win Best Artist on Japan Records Awards next year". On the 52th Japan Records Awards (sponsored by the Japan Composers Association), held on the 30th at the New National Theatre on Shibuyaku, the 4-member unit S/mileage was chosen as the Best New Artist. When they received the award, the four girls were overjoyed and said in tears "We'll do our best in order to win Best Artist on Japan Records Awards next year". S/mileage is in Hello! Project, they're a female idol group with an average age of 15 years old. On April last year, they were chosen from Hello! Project Eggs to form this group. The group debuted on May. They have released four indie singles. Musical producer Tsunku launched the "Target: debut! S/mileage smiles campaign", and the conditions for them to have a major debut were "to collect the photos of the smiles of 10,000 persons until the deadline, which will be used to complete a mosaic". Said challenge was achieved and thus they had their major debut this year with the single "Yumemiru Fifteen". The ones who shined as the New Artists were the Hello! Project 4-member unit, S/mileage. 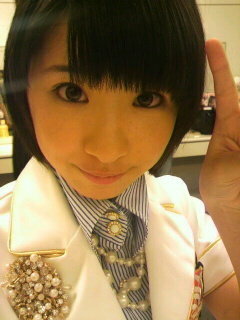 Leader Wada Ayaka (16) commented "We got this (award) thanks to the support of the fans and the staff. we'll do our best to win the big prize next year". S/mileage were chosen as the Best New Artist. Leader Wada Ayaka (16) said as she cried "Tsunku-san, we won the Best New Artist award! ", facing the camera. She also said, talking about her expectations "So far, we've been supported by the staff and other people, it's thanks to lots of people. From now, to get the support of lots of people, and to win the big prize next year, we'll do our best (laughs)". On the music award ceremony, held annually, "52th Japan Records Award", celebrated on the 30th, the 4-member girlgroup S/mileage, who had their major debut on May this year, won the Best New Artist award. Their catch line is "the beautiful-legged group with the short skirts in Japan", similar to the catch line of SNSD/Shoujo Jidai. Both groups had a "beautiful legs showdown". As the newest artist of Hello! Project, an army of idols lead by Morning Musume, the four of them were chosen from Hello! Project Eggs on April to form this group. After their indies, they had their major debut this year with "Yumemiru Fifteen" on May 26 (it achieved 5th place on Oricon weekly chart). They shouted out on stage to musical producer Tsunku, also producer of Momusu, "Tsunku-san, we took the Best New Artist prize! ", and they were seen overjoyed. They said enthusiastically "We got the support of lots of people, and we'll do our best to win the Best Artist prize next year". This award has an story of more than 50 years. It's been held by the TBS group this year as well, and it starts at 6pm on the New National Theatre. The host of the show has been Sakai Masaaki for 15 years, and the responsible of the ceremony has been Fujiwara Norika for 2 years. 2010: S/mileage for "Yumemiru Fifteen" (winner), ICONIQ for "Change Myself", Kikuchi Madoka for "Koibito-san sa" and SNSD/Shoujo Jidai for "Gee". 2009: BIGBANG (winner), Sakura Maya, SCANDAL and Hilcrhyme. 2008: JERO (winner), GIRL NEXT DOOR, Kimuguren, Sakurai Kumiko, Fukui Mai. Japan Record Awards: Best New Artist of 2010 "S/mileage"
On the 52th Japan Records Awards (sponsored by the Japan Composers Association), held on the 30th at the New National Theatre on Shibuyaku, S/mileage was chosen as the Best New Artist of 2010. Abe Hiroshi, who stars in the drama "Newcomer" presented the awards. S/mileage said with joy "Tsunku-san, we took the Best New Artist prize!" and "We'll do our best in order to win the Records big prize next year". The runner-ups were ICONIQ-san, Kikuchi Madoka-san and Korean idol group "Shoujo Jidai" (Mainichi Shinbun Digital). And one last prize. From the nominess for "Best New Artist", the 4-member idol group S/mileage won. When the four girls stood up from their seats to receive their award, they fell down. The host said "are you alright?" with worry, since they couldn't walk smoothly. The Best New Artist is the 4-member group S/mileage from the Hello! Project idol army. From Hello Pro, Morning Musume has won it on 1998 and C-ute on 2007, making S/mileage the third (Hello Pro) artist to win it. Their average age is 15.3 years old. The announcement was at 8pm, and the four girls happily walked to the stage. Filled with emotion, leader Wada Ayaka (16) announced "we want to win the Best Artist award next year". Formed on April last year, they debuted on May this year by music producer Tsunku (42). Their catch phrase is "Idols of the short skirts in Japan", and Ogawa Saki (14) said "we have fresh legs today too". With their white mini skirts that highlighed their beautiful legs, they performed their debut song "Yumemiru Fifteen". On the 52th Japan Record Awards ceremony held on the 30th at New National Theatre, female 4-member group S/mileage took the prize of Best New Artist. They said "kyaa!" and then the four girls cried. When their name was called for "Best New Artist", all of them held each other's hands, and stood in excitement to the center of the stage. "This is thanks to the fans who gave us support, Tsunku-san and other people. We want to do our best to win Best Artist next year", leader Wada Ayaka (16), with a smile, after crying, talked about her big dreams. Their average age is 15.3 years old. With their white mini skirts of 30 cm, they performed "Yumemiru Fifteen". Their conceit is "idol group with the short skirts in Japan". At the beginning of the show, the Korean female idol group with the same conceit, SNSD/Shoujo Jidai, was also standing in line as one of the Best New Artist nominees. They were Eggs at Hello! Project, from where Morning Musume is. Currently, it's said that AKB48 are the #1 idols known nation-wide. S/mileage debuted on May this year, and their three singles have entered the top 10 of oricon chart. They had their first nation-wide tour on fall, and they have gained steady fans. It's been 3 years since a Japanese artist has won this award. The four of them are walking towards their big dreams, and Wada firmly said "We'll do our best as the beautiful-legged idol group with the fresh legs in Japan". 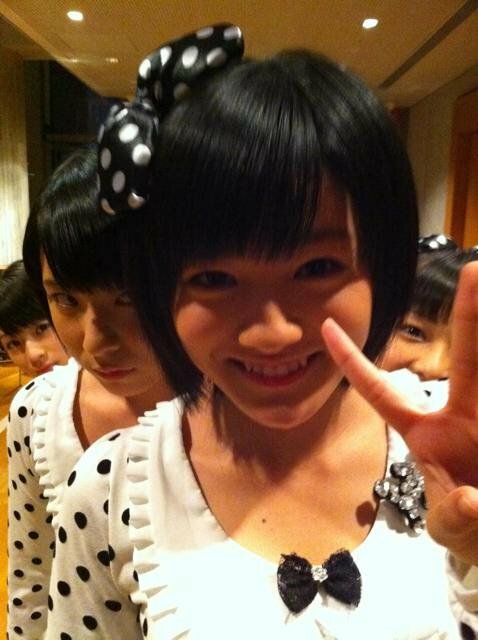 ◆ S/mileage: 4-member group that belongs to Hello! Project, members are Wada Ayaka (leader, 16), Maeda Yuuka (16), Fukuda Kanon (15) and Ogawa Saki (14). Formed in April 2009. Music producer Tsunku imposed them the norm "In one month, you have to collect the photos of the smile of 10,000 people", and once they achieved that, they had their major debut with "Yumemiru Fifteen". So far, they have released three singles and one album. 4-member group S/mileage was chosen as the Best New Artist. They were selected from Hello! Project Eggs on April 2009. They had their major debut with "Yumemiru Fifteen" on May this year. Just like the title, the average age of the members is 15 years old. Their catchphrase is "Idol group with the short skirts in Japan". About their rivals, they've said "Regarding pretty legs, we won't lose to Shoujo Jidai-san. 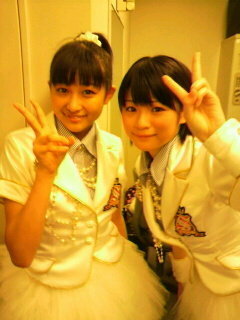 Regarding smiles, we won't lose to the senpai of our agency, Morning Musume-san". They're hopeful about them being emerging currently. Thank you a lot for supporting us, everyone!! I really don't know how I feel now. Particularly, when our name was called, I really couldn't believe it. My face became like this. I don't know my true feelings yet, but, I'm really thankful for everyone's support. Since I haven't put my feelings in order, so I'll write again later. Ah!!! ... Thank you a lot. P.S. Everyone who cried, please laugh now and forever. 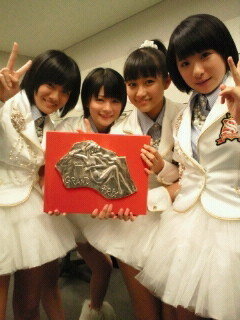 We, S/mileage, were able to win the Best New Artist award of "Shining 52th! Japan Record Awards". I was so happy and surprised that I cried. S/mileage, who got the support of all the fans, the staff, their families, the senpais, Tsunku-san, lots of people. I haven't put together my feelings now, so I don't really know if what I'm writing is good. But I wanted to tell everyone my gratitude! I think I'll write about the regretful things tomorrow! From now on, I'll do my best. We won Best New Artist! Somehow I still can't believe this. But we got this great award thanks to all the fans, Tsunku-san, the staff and our families! I'll do my best when I return to the stage once again. They were able to receive the Best New Artist award on Japan Record Awards thanks to everyone's support. Really, thank you! The contest starts since next year. A start line has been finally marked. Right there! Let's praise them today. Everyone, please greet them with your praises! S/mileage-chan is the Best New Artist of 2010! Ah... it reminds me of 12 years ago. Too happy. I took a pic of the video. Everyone, did you watch Record Awards? S/mileage, who's from Hello! Project as well, won Best New Artist. ℃-ute has received Best New Artist too, and somehow this reminded me of that time. 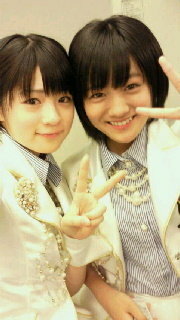 Yeah~ ℃-ute will do their best, so we don't lose to S/mileage. Now what I will do in my free time? I wonder? Ah, I ended up talking too much, but, really, congrats S/mileage! From now on, everyone be enthusiastic please. 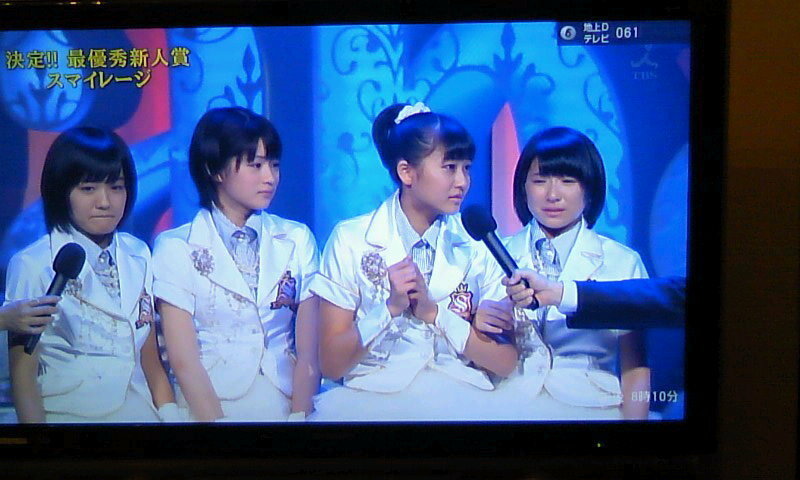 Talking about TV shows, today S/mileage won Best New Artist at Japan Records Awards. As soon as my work finished, I was glued to the TV. Let's do our best on the New Year's Hello! Project concert.